You know what it’s like…you’re standing in line at the grocery store checkout so you start to flip through all those tempting magazines in the stands while you’re awaiting your turn to unload your stockpile. You know you really want to reach for that glossy Kardashian/Alien Zombie baby cover one (no, I didn’t not really just say that), but instead you reach for a small publication called “Cooking With Beer”. That is where I found this recipe. Of course I fooled and played with it, but the original concept was birthed right there in the grocery store checkout lane. Eeeewwww. LOL! Sadly, I don’t have any “beauty shots” of this final dish, but can I tell you something? Once it was allowed to cool slightly (approximately 15 minutes) it served up beautifully when sliced into lovely, layered squares and made quite a fancy presentation! This recipe is not hard to make but it is slightly time consuming so make sure you plan accordingly. I made mine for a backyard BBQ we’d had so I made it in advance and partially baked it off in the oven before I completed the baking on the outdoor grill after our company had arrived. 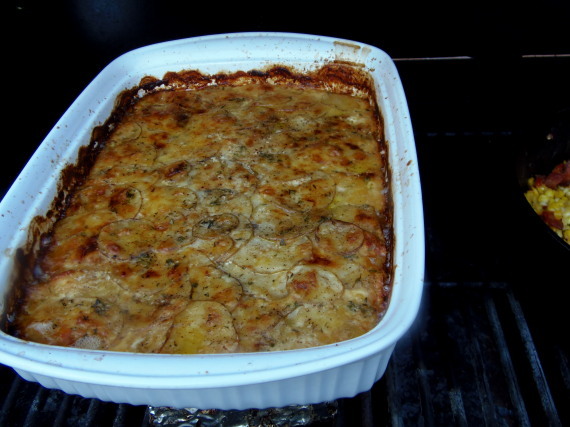 It worked like a dream and this dish got rave reviews from all! Sadly, there were no leftovers (which explains the reason for no beauty shots). I encourage you to make this dish if you’re looking to WOW your family and friends with superior taste and presentation! It’s a real show stopper! -In a small saucepan over medium heat, bring the beer, thyme sprig and bay leaf to a simmer. 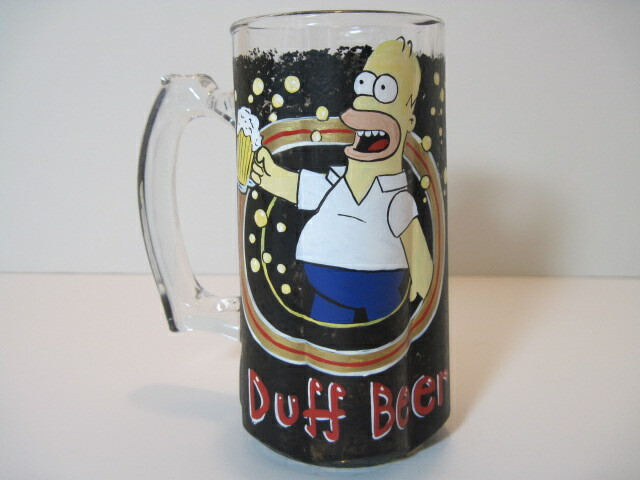 -Reduce the heat to low and continue to simmer until the beer had reduced considerably (approximately 5 minutes, but watch this carefully as it has a tendency to boil over). 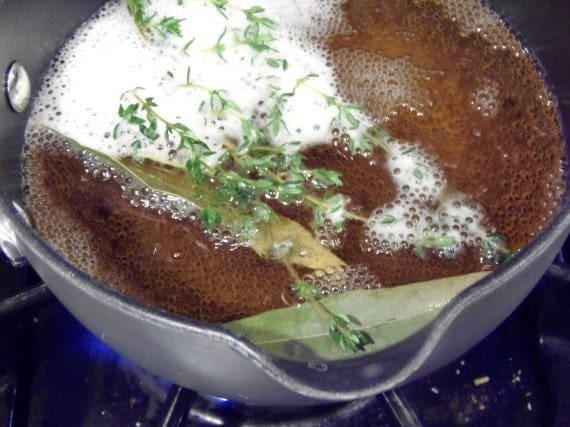 -Turn off the heat and discard the bay leaf and thyme sprig. 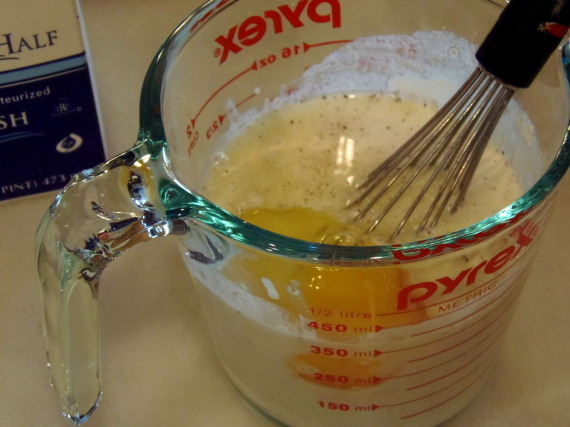 -In a small bowl, whisk together the half and half flour, egg and garlic. -Stir the half and half mixture into the beer mixture and set aside while you prepare the potatoes. 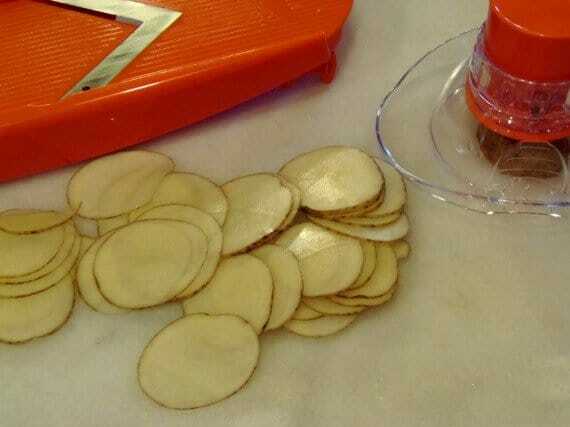 -Using a mandolin or chefs knife, slice the potatoes as thin as possible into discs. 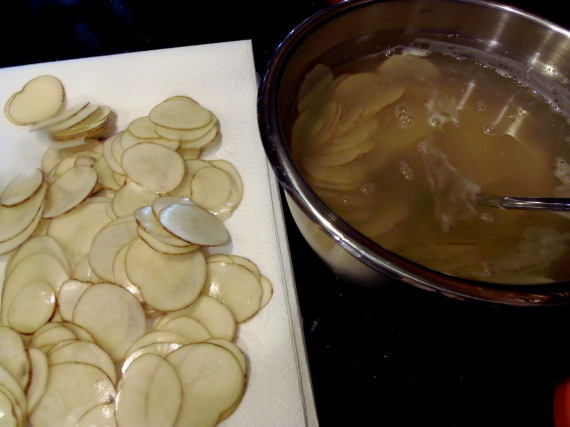 -Once the potatoes are sliced, place them into a large bowl of ice water, stirring to separate the slices, and to remove some of the starch in order to keep the potatoes from turning colors. 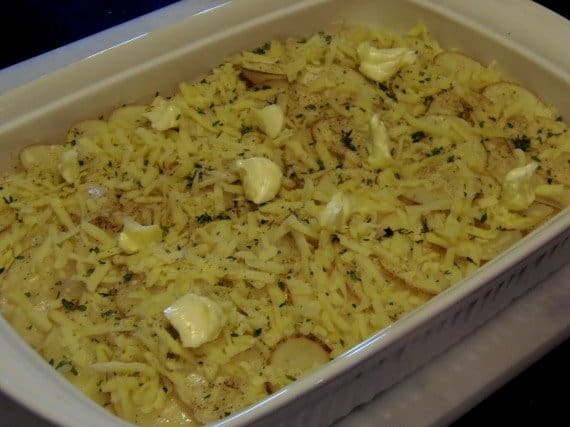 -Remove the potatoes from the water using a slotted spoon and dry them on paper towels (you’ll be working in batches, so no need to do all the potatoes at one time). Replace the paper towels as needed. 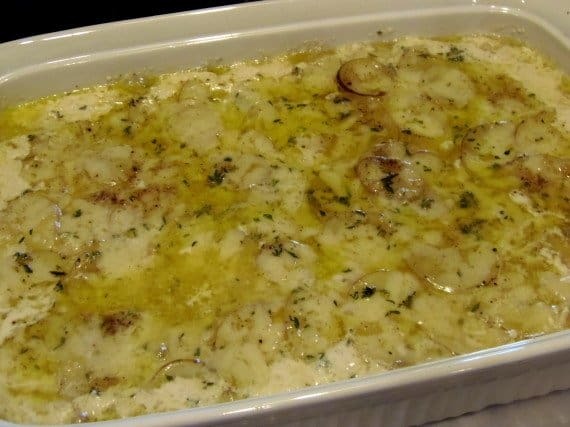 -Prepare a 9×13 baking dish with a liberal coating of butter on the bottom and sides of the pan. 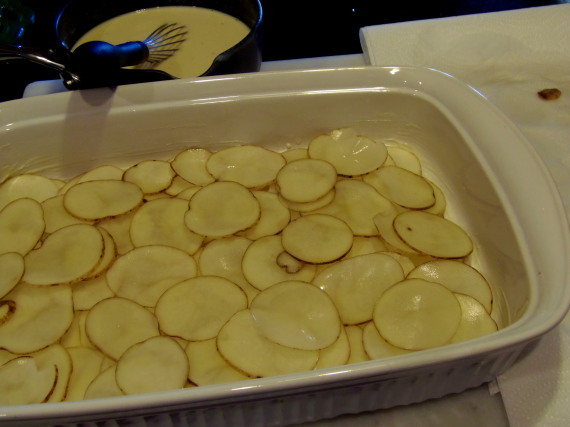 -Start the layering process by starting with overlapping slices of potatoes to evenly cover the entire bottom of the dish. -Sprinkle with half the the salt, pepper and chopped thyme. -Pour 1/2 of the beer mixture over the first layer of potatoes. 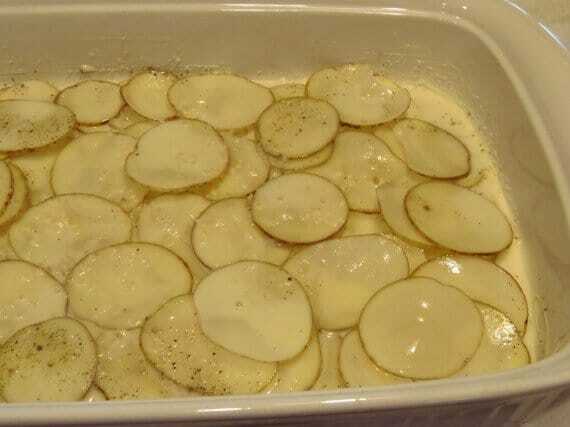 -Layer 1/2 of the cheese mixture over the potatoes and beer. 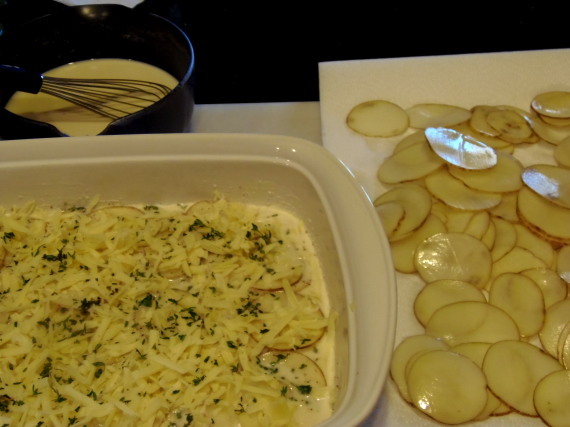 -Repeat the layers of potatoes, beer mixture, seasonings, thyme and cheese. 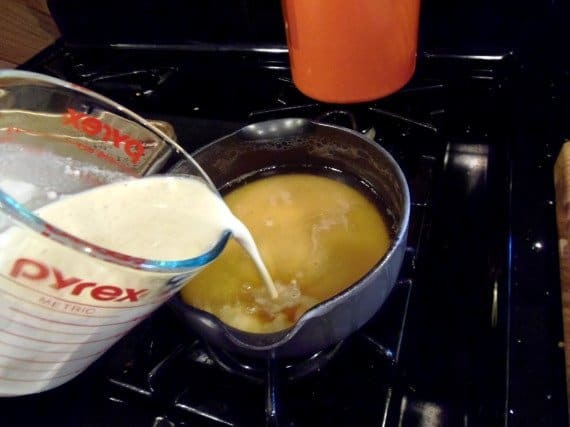 -Dot the top with butter. 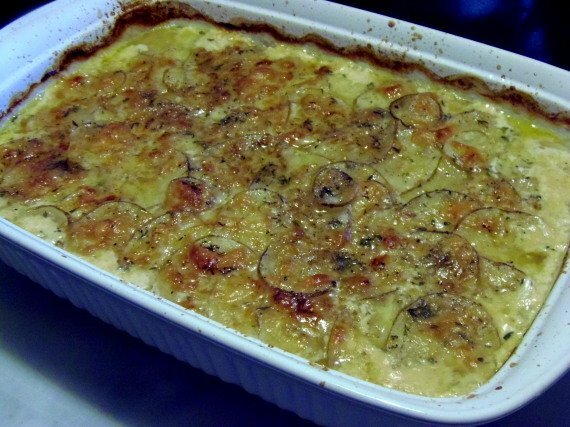 -Cover and bake in a preheated (400 degree) oven for 30 minutes. 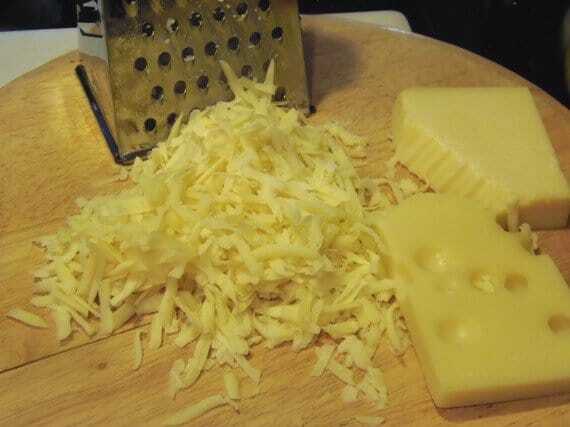 -Uncover and continue baking for an additional 30-35 minutes until the cheese is browned and bubbly. -Allow to cool and serve OR cool, refrigerate and reheat on the outdoor grill on medium heat until its even deeper browned and heated through. Allow to cool slightly before slicing and serving. Whatever your preference of beer, you need to make this dish… It’s D-LISH! Thanks for coming to visit me in my Kudos Kitchen ~ Where food and art collide on a regular basis!